Today’s modern society brings forth smartphones, tablets, game consoles, virtual reality and many more cool technologies children adore. Alhough education is a slow learner, our lessons become more and more digital and interactive. Because everything is so digitized, children hardly ever go outside, which has a lot of disadvantages to their health, and leaves them missing out on certain skills. Imagine a solution where our students close the classroom door behind them and go outside again? The outdoors has many learning oppurtunities. Nowadays, there are a lot of applications that make sure that students come out again, and learn while doing so. 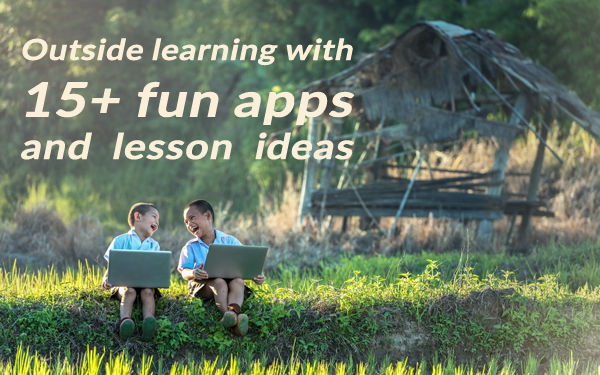 In this blog, I’ve chosen 16 apps that you can use to teach outside. And, of course, it’ll motivate your students as well to go outside a bit more. BookWidgets has many digital templates or widgets teachers can and complete with their own content. The Arithmetic Widget lets your students solve simple arithmetic problems. You choose the kind of arithmetic exercises you want your students to solve (additions, subtractions, multiplications, divisions, …), and your students get an interactive widget that lets them solve automatically generated calculations. Lesson idea: Hide a surprise on the playground, and create an arithmetic widget for your students. Students use iPads or their smartphones to solve the arithmetics. With every correct answer, your students get a ‘bonus’ letter. Eventually, a word will reveal itself. The word’s a clue to where the surprise is hidden. The first student who completes the widget knows the place and will find the surprise. With the AirMeasure app, you can measure everything around you directly with your smartphone. The augmented reality feature on your students' device allows them to measure everything in a very easy way. The app is actually a ruler, only virtual, and it always fits in your pocket. Students open the app, focus on what they want to measure and within a few seconds they know the dimensions. Lesson idea: Let your students take a walk in the playground or go around the school building and let them use the app to measure things like toys, windows, doors, and so on. Use the BookWidgets whiteboard widget to create a route or map for your students. Add a voice recording students have to listen to. In the other half, students have to sketch what the teacher is saying. Use this for listening or reading exercises. 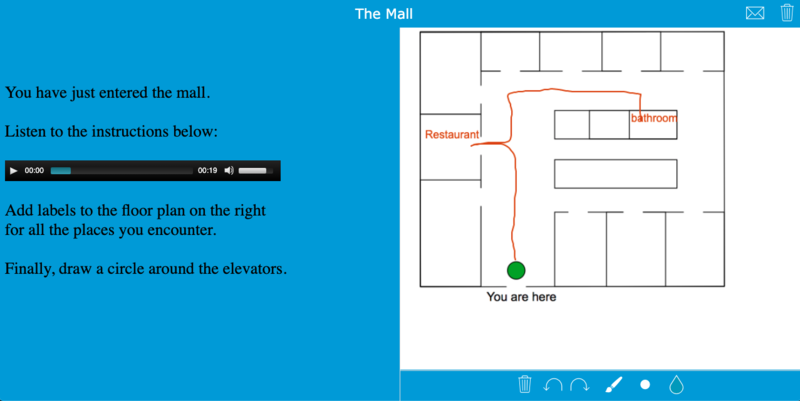 With the Magic Plan app you can create maps in a fast and fun way. You can do this with the camera of your device. Mark the corners of your room as you rotate. When you’re done, Magic Plan makes a map about the environment for you. That’s how easy it is! Let your students discover nature and look for different plants that are common in the environment with the PlantNet app. Thanks to the innovative use of PlantNet visual recognition technology, plants or flowers can be recognized immediately just by taking a picture. This allows you to learn more about the native plants in your ecosystem in a fast and fun way. Lesson idea: When you visit a forest near the school, divide your students into groups. Let these groups walk around a bit and let them take pictures with the PlantNet app of different plants and flowers they encounter. Then the groups explain to each other what plants and flowers they found. This app gives you a plan that guides you through the entire planting process, from sowing to harvesting. 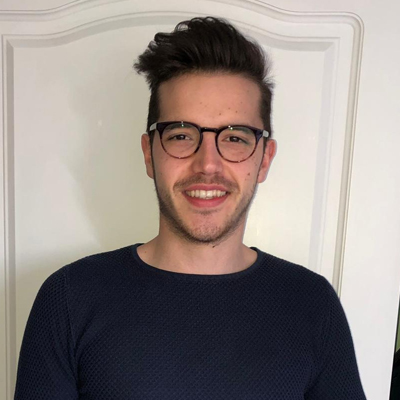 The app also adapts to the location where you are, so depending on the weather you will get a different plan to grow your vegetables, fruit, and herbs. Lesson idea: If you’re setting up a garden project, use the Garden Plan Pro to guide your students and give them advice on different topic. How should they grow the vegetables, fruit and herbs? The app will help! You can also divide your class into different groups, each specializing in either vegetables, fruit or herbs. Then let them tell each other how they did it and what they learned from it. Teach your students more about the stars and the universe with the Star Walk app. Use this augmented reality experience to teach them about the constellations, stars, and planets that are visible to the naked eye. I guarantee they will be amazed. Let them search for the big and small bear, the polar star and the different constellations that exist. Lesson idea: Teach your students all about astronomy. Then let them download the StarWalk app and use it in the evening. Instruct them to take a picture of the pole star they can find using the StarWalk app. If you’re on an overnight schooltrip, this would be a fun activity as well! Use the BookWidgets Google Maps widget so students learn how to navigate themselves. Use this widget when you’re visiting a city with your students. In this Google maps widget, you can add pop-ups with text, images and links to certain places. Lesson idea: When taking an outdoor trip with your students, give them a Google maps widget and let them navigate themselves to the indicated spots. They should be able to orientate and reach their destination. They have a digital map after all. Somtimes they will have to take the subway or bus to get to their destination. It teaches them how to look out for themselves in a big city and, of course, how to read a map. Take a look at this example. You can also add questions in the pop-ups if you want your students to finish an assignment. With a compass app such as the Gyro Compass app, you can let students explore the outdoors. Teach them navigation skills or how they have to follow a trail map. This way you can also learn them how to make their own plan. Give them a map, their final destination and explain how to use their compass! And if you are afraid they get lost, you can easily find your students again thanks to the location on their mobile phone. Lesson idea: Orienteering walk or hike. When you visit a new city or place give your students a map and let them use the compass app, to look for a number of marked points in that city or place. With the help of the map and compass app, students look for marked points, which are marked on the map. The route is not indicated in advance and is determined by the students themselves. This way, they learn to discover a city in a new and fun way. 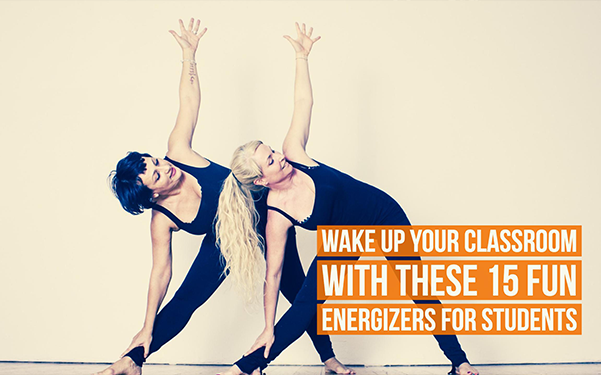 This app is ideal for getting your students to get moving. This is not just any ordinary running app. As a teacher, you can plan the route your students need to take in advance. You can also follow them through the live tracking, and you can encourage them if you see that they are having a hard time. On this app, your students can also see how fast and how far they have walked/ran. And with a heart rate monitor, they can see their heart rate. Students can use this information in other lessons to calculate, for example, their ideal tempo. Lesson idea: Use Runtastic to draw different routes from which your students can choose. Those routes can have different difficulty levels. It’s a good way to differentiate in sports. Once they have installed this app they can choose and finish these routes. Follow your students live as they run and encourage them via the app. Let students discover a new trail nearby or find a place to camp with the whole class in the ‘wilderness’. Thanks to this website you can find adventurous and hiking opportunities in your area. Combine this app with some of the apps above and make it a fun trip with your class, and they’ll learn a lot! Lesson idea: Are you going to visit a new city with your students? Use the Outbound app to show them all the nice spots. At these places, you can hide an assignment that they have to complete before they can go to the next place. Use the quiz or worksheet widget to create a fun quiz or assignment with different types of questions such as multiple-choice questions, drag and drop images, fill in the blanks, ….. The students' results are emailed to the teacher after the quiz. You can make it as difficult or as easy as you want. Discover History’s Treasures with the Civilisations AR app. Bring realistic, to-scale artifacts from History into your own outdoor classroom using Augmented Reality technology. Move, scale and rotate the collection, allowing you to become the explorer. Use the magic “Spotlight” to reveal audio guides and special features. Take and share photos of the objects in your home, garden or school. Lesson idea: Let your students look for the different artifacts that this app offers and project these artifacts via their phone on the playground. If they know all about an artifact, let them take a picture of it. Then let the students tell each other what they have learned about the different artifacts. This app isn’t without any cost, but it is very engaging and fun! With Xnote, your students go on a virtual treasure hunt to find your hidden message. Xnote allows you to hide virtual messages (with or without pictures) anywhere in the world. The students that receive the message have to physically go to that spot to be able to read the message. You can even chain messages to create an extended treasure hunt. Lesson idea: Treasure hunt! Use the Xnote app to take your students with you on a field trip. Divide your students into groups. When your students visit a certain historical city, they should know what monuments to visit. Send them a text with the location of the first monument. When they get there, they’ll be able to open the first secret message. You can add some information about the monument that’s crucial for students to remember or to write down for later. Fun guaranteed! Let students explore nature with their tablet or smartphone. Give them the task to take pictures of specific plants, animals, trees, flowers, etc. If you’re using the BookWidgets whiteboard widget, you can allow students to add a picture they just made to the whiteboard an annotate it. Another way for students to learn to discover things outside is through the Geocaching app. This is a fun app where students have to look outside for hidden codes and coordinates. It teaches them to orientate, look for details, and fun facts about Planet Earth. The best of all is that geocaches are scattered all over the world, so you can do it anywhere, even around your school building’s environment! Lesson idea: Create groups of 5 students and choose 5 caches in your area. Let them all take a picture of their cache and the first team who has found all the caches wins! 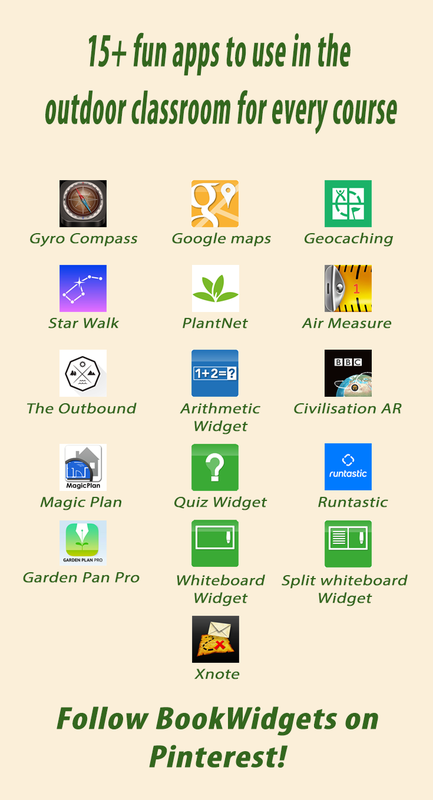 As you can see there are a lot of apps you can use to leave your classroom behind and teach outdoor. Of course, you can do so much more. Just think of what possibilities your playground offers. 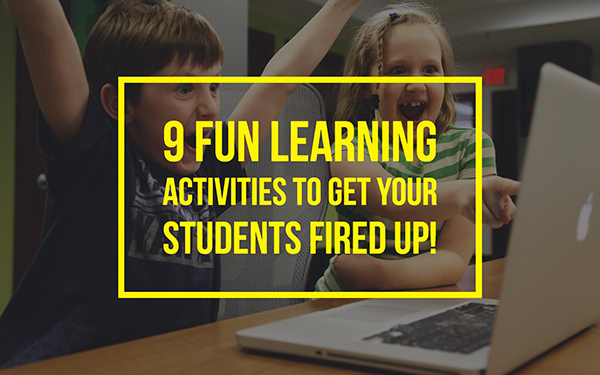 When you combine some of these apps you can create fun lessons for all your students. These were just my own top picks for apps that encourage outdoor learning. 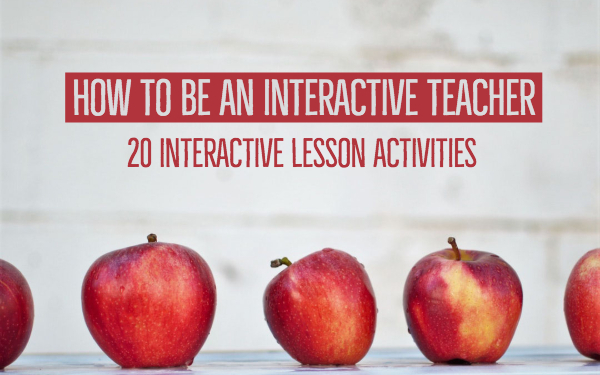 Share this post with other teachers that would like to teach their students more about the outside or just in the outside.